Yadier Molina leads all NL catchers in All-Star voting. 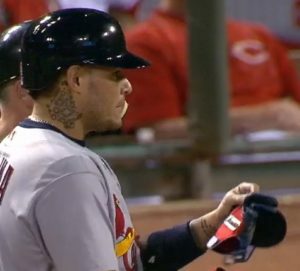 Yadier Molina singled with the bases-loaded and two strikes on him in the top of the eighth inning to break a 2-2 tie, eventually leading to the Cardinals 3-2 win over the Cincinnati Reds on Thursday night. The Cardinals failed to score any more runs with the bases loaded, but Kevin Siegrist and Trevor Rosenthal protected the lead for the series win. Matt Carpenter led off with a double off Ross Ohlendorf. Aledmys Diaz laid down a sacrifice bunt and the Reds missed getting Carpenter at third. Matt Holliday walked to load the bases and Stephen Piscotty, who is hitting over .500 this season with runners in scoring position, grounded to short, which led to a force out at home. After getting two strikes on himself, Molina lined an inside fastball to center to score the run. Brandon Moss popped up to short and Jedd Gyorko struck out ending the threat with the bases loaded. The Cardinals took two of three and have won 18 of the last 22 series with Cincinnati. They are also 32-28, a season-high four games over .500, tied with the Pirates for second place, 10 games behind the Cubs.